Although state Sen. Mark Hutchison may have only just completed his first term with the Nevada Legislature, he now has his eyes set on the job of lieutenant governor, a position he says will continue to allow him to serve the interests of its citizens. Hutchison, who describes himself as a constitutional lawyer, has practiced law in Las Vegas for his own firm, Hutchison &Steffen since 1996. A Nevadan born and raised, he attended the University of Nevada, Las Vegas before going on to graduate from law school at Brigham Young University in 1990. Prior to his election as a representative of Senate District 6, Hutchison represented Nevada in a 27-state challenge on the constitutionality of the Affordable Care Act. Although the law was ultimately upheld by the U.S. Supreme Court, Hutchison said the experience led him to realize he wanted to work within the government to protect the constitutional rights and economic interests of Nevada’s citizens. 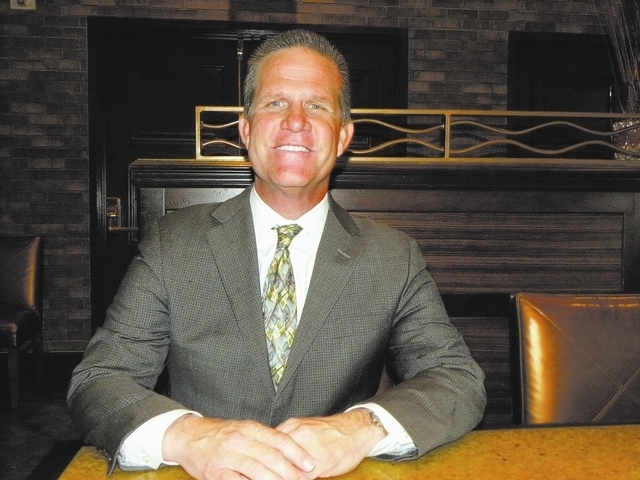 Last week Hutchison sat down with the Pahrump Valley Times to discuss his campaign for lieutenant governor and what he hopes to accomplish if elected later this year. Q. What made you decide to run for lieutenant governor? A. I was appointed by the governor to represent the state of Nevada in the constitutional challenge to the Affordable Care Act back in 2010 and so I represented Nevada all through the District Court level, the court of appeals level and then at the U.S Supreme Court. And you may recall 27 states were involved in that constitutional challenge and I saw first-hand what I think is the overreaching by the federal government in our system of government. I’m a constitutional lawyer, and I believe in our governmental systems that are in place in this country and I became very concerned at the direction the attacks on our system of government were heading. So I thought the states would be the place where the future battles are going to be in terms of preserving our system of government and our way of constitutional life. As a result I was involved heavily in that litigation. After the litigation concluded and the U.S. Supreme Court actually upheld the Affordable Care Act, I thought to myself I want to be involved in a meaningful way in state government because to me the states are the last line of defense for our constitutional freedoms. I felt like the lieutenant governor’s position was a great job for me given my unique background because I believe you have to continue to have a strong voice to protect the constitutional rights and to promote the economic interests of Nevadans within the executive branch. And so that’s what led me ultimately to run for lieutenant governor. Q: Gov. Brian Sandoval has already given you his endorsement for the position. Do you think that will help with your campaign? A: I am grateful to have the governor’s support and his endorsement. But I have to earn every vote. I’ve got to gain the confidence of the voters of the state of Nevada. I have to provide to them a reason to vote for me and I think the reason voters ought to vote for me is I will always protect their constitutional rights, I will always protect their property interests and their economic interests and do all I can to grow jobs in the economy of Nevada. Q: What are the some of the first issues you would like to address if elected? A: The first thing I want to do is to ensure Nevadans continue to enjoy their constitutional rights. One of the things I’m really concerned about is the federal government really overreaching its position and responsibility and encroaching on the rights of states and their citizens … and I’m going to be a strong voice to push back at the executive branch level in the state of Nevada. The next thing I want to do is ensure Nevadans continue to see their economy grow, continue to see jobs promoted and I think we have some real great opportunities to do that with continued emphasis on our strengths in the tourism and gaming industries. We want to bring more international tourism to Nevada. The lieutenant governor chairs the commission on tourism and that focuses in a large way on rural tourism, so that’s why the lieutenant governor’s position is important here in Nye County and in the rural counties. We promote rural tourism and we also promote tourism within Las Vegas and Reno as well, but Las Vegas and Reno have a lot of help there, we need to provide more help, I think, within the rural areas with tourism. I think we also need to take advantage of new opportunities for us. For example, Nevada just became one of six test sites, approved by the FAA, to begin to test and develop unmanned aero vehicles for commercial applications. Nevada has been a leader on the military side of unmanned aero vehicles with Creech Air Force Base, and now Nevada moves to the commercial and civilian side of unmanned aero vehicles and we have great opportunities for economic development and job creation with the billions of dollars of economic impact that industry will have in Nevada as well as the thousands of jobs it will create. Having said that, I want to be a leader in the state legislature and the executive branch, if I’m given that opportunity as lieutenant governor, to make sure that we protect, and this gets back to point number one, Nevadans constitutional rights. We have very strong Fourth Amendment rights that need to be considered, we need to develop policies that protect our privacies, we need to develop laws that protect our privacy as this industry develops and begins to expand, we need to make sure our policies and our laws are ahead of the curve and in fact I think we should lead the nation in ensuring privacy is protected in this developing and emerging industry of unmanned aero vehicles. Another great opportunity for us is going to be the storage and processing of electronic and computerized data systems. There’s a company in Las Vegas called Switch Communications, and sometimes we generically refer to this type of technology as switch technology, but it’s really the technology of storing all of the data these huge companies like Google and eBay have to store in these major servers. And Southern Nevada, including Nye County and Clark County, are perfectly situated from a climate standpoint and from a geographic standpoint, to have these major servers store all of this data. there’s just great job opportunities and growth there. I was just talking with the owners of Switch Communications and they told me they anticipate hiring more and more technical engineering professionals in these business communities to handle this kind of process and storage of computerized data. And these are good paying jobs. They’re fifty, sixty, seventy thousand dollar a year jobs that those who come out with even two or three year certifications can get. So we will continue to see that expand and I want to continue to be a leader and help expand that industry so we can focus not only on our strengths within the industries of tourism and gaming, but also focus on some of these new emerging industries like aeronautical and space businesses as well as data processing and storage businesses. Those are real opportunities to create thousands of very good, high paying jobs that will really help us diversify our economy. Growing up there were two games in the United State when it came to gaming, there was New Jersey and there was Nevada. Now over half of the states have legalized gaming and more and more are doing that it seems like every year. So we have to play to our strengths, we will always be a strong gaming economy, but we have to develop these new areas. I think that’s going to be an absolutely critical role the lieutenant governor plays going forward in partnership with the governor and the legislature in developing these new economies and really making sure we get ahead of the curve so we can diversify our economy so that as gaming revenues decrease, as they likely will over time with so much competition, we begin to replace that with other industries and businesses that contribute to our economy. Q: Is there anything else you want people to know about your run for lieutenant governor? A: I think what people can rely on is someone who believes passionately in the Constitution of the United States, who believes passionately in our system of government, who believes there is a role for the federal and state governments and that we ought to protect and enhance those roles and make sure our rights as citizens and Nevadans are not encroached on by anyone, including the federal government. And I think there are few candidates who can say they’ve had the experience and the level of involvement that I have in protecting the constitutional rights of Nevadans.